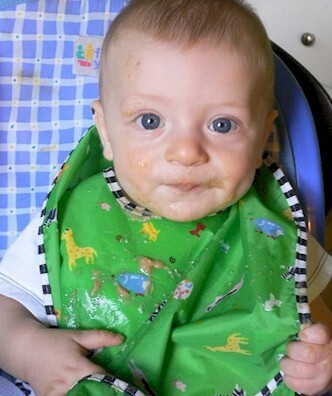 A couple months before my son's first birthday, I thought: Wait, I’m expected to keep a small child alive on human food? I am unprepared! How is this done? Why don’t they cover this in parenting classes? Because, realistically, that first year is easy food-wise: just give me the milk and nobody gets hurt. But the doctor warned that by the end of the first year, milk alone is not enough to meet their nutritional needs. And so began the next “phase” of his life: the one in which I try to feed a tiny human real food, with substance. After tossing and turning one night trying to figure out some sort of Food Management System that didn’t involve me buying a set number of freezer packages and jars each week, I had my “aha” moment one night, and I declared it: SOUP! Soup will be the answer. Seasonal, delicious, chock-fulla-good-stuff soup! You can make soup out of just about anything, and by golly, I would. Pureed until he handled textures like a pro; chunky and stewy soon after that. As I took my son to the market to buy summer squash, onions and sweet potatoes smiling because he would really have no idea what he was eating most of the time. “Soup! Soup is the answer!” I hummed as I wheeled him from stand to stand. For many nights, he slurped down as much soup as we’d heat up for him. Hooray for carrots! Hooray for zucchini! And then finally one night, he put his hand in front of his mouth and decided he would from that point forward, despite being unable to hold his own spoon, that he was too grown-up to be spoon-fed. And then the REAL fun began. Anne has been with Invitations4Less.com since 2004 and came to us already knowledgeable about social stationery after previous employment with a wholesale printing firm. Anne is mom to two young children who keep her busy and dreaming of sleep. But she wouldn't have it any other way! To help reduce spam, please enter the random characters below into the field to the right.